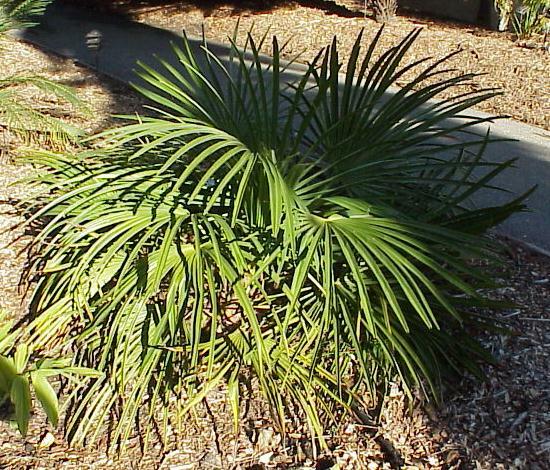 Trachycarpus nanus is, as its name implies, smallest representation of the Trachycarpus. The frond color is often an attractive bluish color when mature. Another interesting feature is the fact that the inflorescences are upright, an adaptation to keep them off the ground. A true botanical scarcity and is threatened with extinction in its natural habitat, with the inflorescences being eaten by goats before they fully bloom. The habitat of origin is Southwest China in Yunnan, where it grows on slopes in company of bushes and tall grasses at approximately 6500 feet altitude. Has a high resistance to cold. Subterranean trunks can be up to 6 feet deep and 2 inches in diameter, but rarely above ground. The fresh kidney shaped seeds should germinate quickly, generally 1 to 2 months after sowing. see Principes April 1993 Vol. 37, pages 64-72 for more information.